Nominally, Edinburg North senior Azael De Leon was a center back. After playing forward during his freshman and sophomore seasons, De Leon moved to fill in a hole on defense during his junior year and remained in that role for his senior campaign. The title didn’t keep him from being the Cougars’ leading scorer. While holding down the back line, De Leon found the back of the net again and again on an array of free kicks and headers, helping spark North to its best season in program history and a trip to the Class 6A Region IV final. For his effort, De Leon is The Monitor’s All-Area Defensive Player of the Year. Standing 6-foot-2, De Leon was an imposing presence on offensive corner kicks. When coach Elias Moran sent De Leon to forward in an effort to crack the San Antonio Clark defense during the regional semifinals, De Leon found an opening to head home a long crossing pass. 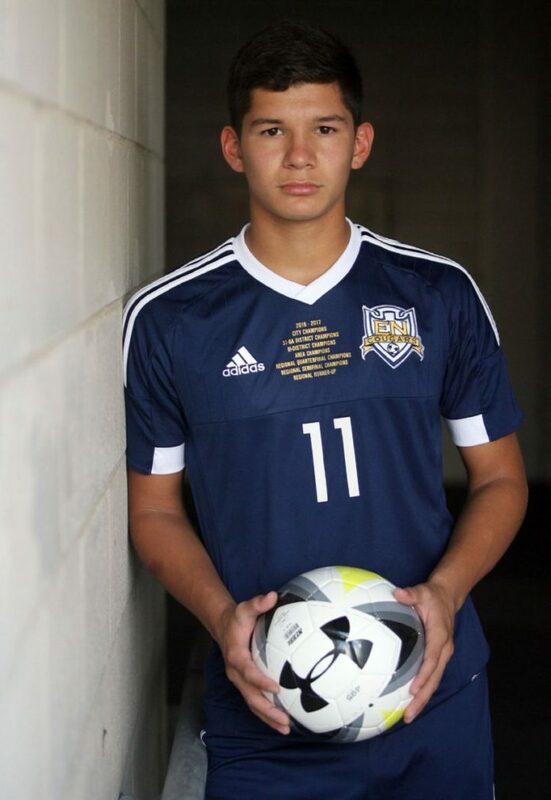 De Leon said he thinks he’s most potent on free kicks, like the 35-yarder he drilled to lift Edinburg North to a 2-1 win against Harlingen South in the bi-district round. Moran said De Leon scored on kicks of about 40 yards five times. The senior also notched a hat trick in a 3-1 win against PSJA North. Moran said De Leon needed a season of experience to feel at home in the defensive role. By senior year, De Leon had developed into the ideal leader and motivator, helping maintain tactical order throughout the formation. De Leon will be attending UTRGV next year as a mechanical engineering major, and he said he plans to attempt to walk on to the soccer team.